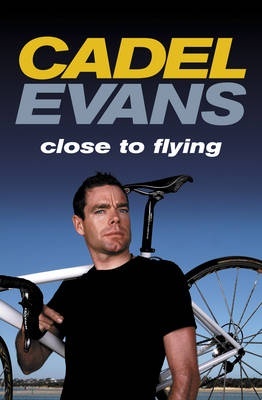 Soon after the book was published some humorist replaced the photo of Cadel with a more tearful one and changed the title to Close To Crying. That’s a bit unfair to Cadel, who’s a guy who gives his all until he’s wrung out and who wears his heart on his sleeve. As someone who gave up watching tennis years ago because I could find no joy in the machines that play it these days, I’m happy to see someone who makes sport look like the kind of place where the peaks and valleys of emotions are so much deeper than in regular life. Regular life is kind of boring, which is why they make so few movies about it and so many with super-heros and super-villains, vampires and bank robbers. The other thing about Cadel is he’s a proper tough guy. You don’t win a Tour de France, you don’t even compete in one, without being able to endure what normal people can’t. As Stuart O’Grady says about himself, he’s a guy who can endure suffering more than most, and that’s what makes him a successful cyclist. Problem is, you get in the elite level and you’re among other guys who are top-class sufferers also. Cadel knows how to suffer, to bury himself and carry on. Let him have a few tears, I reckon. The Close To Crying title of this blog is more a statement of my experience of his book than his lachrymose tendencies. We get a full bio of his child life, from early life in NT to the farm in NSW, to how his parents found the farm…and also somewhere along the way to how Cadel got into cycling. The fact that Cadel didn’t become a bicycle mechanic somewhat bemused me. The sense of pre-destination, the spanners… I guess he got sidetracked. On the alcohol front, he’s developed a taste for fine wines and loves a cold beer to quench his thirst but if you’re chasing a scandal prompted by excessive consumption, then turn your attention elsehwhere. Nothing to see here. Yuck yuck. I’m sorry, but even just re-writing that makes me hurt a little inside. I feel like I should be wearing a polyester shirt and braces when I read that.